W-192 Custom bobblehead dolls made to look like you! 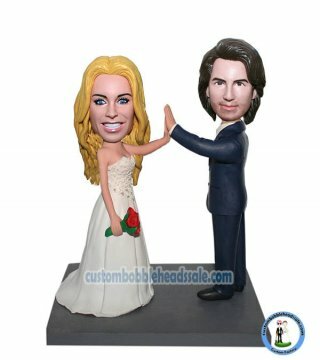 This custom wedding bobblehead depicts groom in a dark blue suit giving high five with bride who is in a white long wedding gown holding a bouquet of red roses.Nothing would make a better gift as a wedding cake topper for a newlywed than a bobblehead doll that’s been customized to look just like them. Many years later, when they look back at this customized bobble head doll,it cant help just having a giggle over them.It brings back a lot of memories and emotions as well. If you want to change the color of the clothes, please leave the message,we can do this for your for free. What a long process that was well worth the wait! I purchased our cake topper as a surprise for the groom. It was perfect! Not exact resemblance, but mighty close!